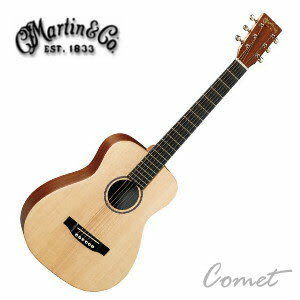 The Martin LX1E Little Martin Acoustic-Electric Guitar is a small travel and student guitar with a solid Sitka spruce soundboard atop the modified 0-14 body to guarantee tight, rich tone. The Fishman Ion-T electronics let you electrify that sound for performance flexibilty, while also featuring a built-in tuner. Micarta fretboard and bridge, 23" scale, Stratabond modified low-oval neck, and Martin's patented mortise/tenon neck joint. Gotoh nickel tuners.